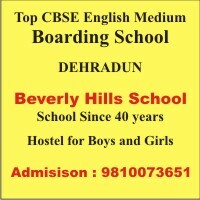 Shiwalik International School was established in 1994 with in a vision and dream to provide quality education to the children coming to the institution.Shiwalik International School is a Co-educational, day, day-boarding and a residential English medium public school situated in the Doon Valley. It is a picturesque valley set amongst the foothills of the mighty Himalayas. It is 250 km north of New Delhi and is easily accessible by road, rail and air. 35 kms to the North are Mussoorie-the Queen of Hills. Shiwalik International School has a truly cosmopolitan character catering to the needs of student from across the world. It aims at a pragmatic, child centered all round education which helps students develop an integrated personality with sound mind and body. The school aims at excellence in academics, extra and co � curricular activities for students recognize their true potential and prepares them to face the challenges of life and to excel in any situation, anywhere in the world. The school is run by veteran management that hails form India's best institutions. It operates like a learning organization. The Management is quite dynamic which keeps bringing in and formulating need based strategies for the benefit of the children. Over the past decade it has earned the faith of hundreds of satisfied children and parents. Every experience and success at the institution only deepens its commitment of fulfilling its vision of providing quality education.